2. 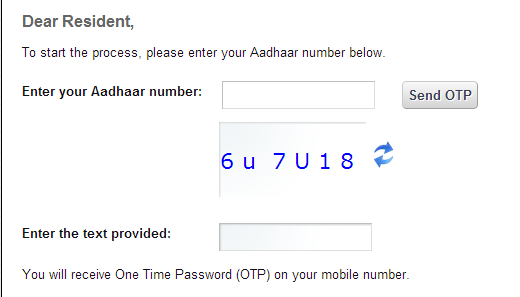 Enter your Aadhaar Card Number and test provided in the image and click on the Send OTP button. If you have already updated the Mobile Number then a One Time Password or OTP will come to your mobile. Now enter your latest Mobile Number and text provided on the image and click on "Send OTP" button available just right side of your Mobile Number. After clicking "Send OTP" button you will get an OTP of 6-digit number on your Mobile and it will be valid for 15 minutes. Now, enter the received OTP in the box and click on "Login" button. Select the checkbox beside the Mobile Number for updating your Mobile Number to Aadhaar Card and click on "Submit" button. Click on "Submit Update Request" button. Review your mobile number, If any changes then click on "Modify" button. If your Mobile Number is correct then select the "I confirm that..." checkbox and click on "Proceed" button to continue. You will also get a confirmation SMS on your mobile number for Submission of Mobile Number Update. You have also the option to take the print out of the same. Now logout with this website by clicking "Logout" link. After a few days the Mobile Number will be updated with your Aadhaar Card. You can register a complaint by either sending an email to help@uidai.gov.in or by calling to Aadhaar helpline 1800 300 1947. You can download Aadhaar update form from www.uidai.gov.in website and fill the same with your new mobile number with the signature you provided at time of enroll. Send this form to address given at update website. i want to change mobile number online , my previous number is not working . Please download the Aadhaar update form from uidai website and fill the same by providing same signature that you provided at the time of enrollment. Send the filled form to the address provided at uidai website. You can also do the same by visiting uidai website and providing ur registered email. @Manoj Kumar You can take same number from customer care. You have to submit identity and address proof... To change mobile number in your aadhar card online, the current mobile number must be working. As the OTP ( One Time Password ) will come to your current number. After getting logged in in aadhar data base you can modify your personal data.. Please download the Aadhaar update form from uidai website and fill the same by providing same signature that you provided at the time of enrollment. Send the filled form to the address provided at uidai website. 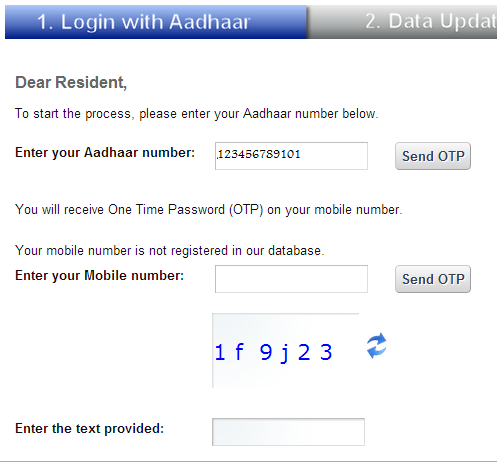 You can also do this by visiting uidai website and providing ur registered email. IF WE ADD TELEPHONE NIUMBER!!! HOW CAN WE CHANGE IT??????? please assist me in downloading the aadhar as i lost my registered mobile number! If you lost your mobile number then first you need to visit nearest Aadhaar enrolment centre. 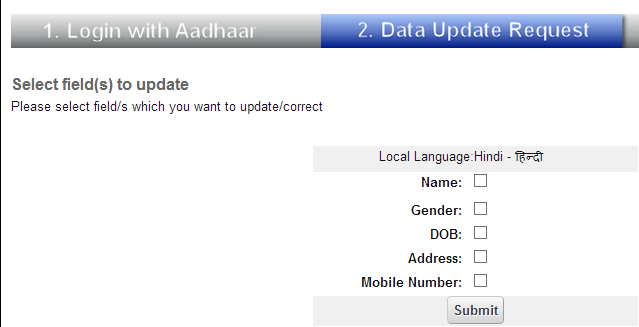 You can update your new mobile number over there, You can also get your Aadhaar card from there. 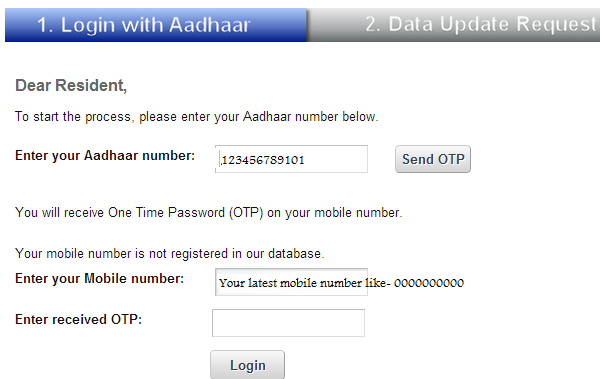 To download your Aadhaar Card online registered mobile number is necessary as they send OTP on this. Visit uidai website by providing ur email and update the same. Visit uidai website to do this. I am not getting mobile option , see as below. If you have not already registered your mobile number then visit nearest Aadhaar enrolment centre. If you want to change the existing mobile number then follow the above procedure. For your privacy, Please DO NOT share your Aadhaar Card Number/Mobile number in any comment. Kindly visit nearest Aadhaar enrolment centre. sir I want to update my mob no but unfortunately my registered mob no is not working so I am unable to get an otp. Kindly visit to nearest Aadhaar enrollment centre. hey how many days it takes to register mobile number for first time? For first time, You need to visit nearest enrolment centre. It will be done immediately. You can use the procedure mentioned above. First time you will receive an OTP to your daughter's mobile, Take this and enter the same and change your new mobile number.